One of the first points I highlighted at the beginning of this series on Australian interest rates was the overwhelming consensus among local prognosticators that the next move in the cash rate would be up. Since I did not share this view, I wanted to lay out the rationale for my unusually downcast outlook, and perhaps identify any weaknesses in my reading of the Australian economy that might have led me to this contrarian conclusion. First of all, a quick refresher on where we’re at. By allowing the windfall from higher export earnings to filter out into the economy in the form of higher incomes, Australia wilfully recast itself as one of the highest-cost economies on Earth. This is a particularly acute issue for the manufacturing sector in Australia, which is facing a grim future, but it is also evident in other important export sectors, such as higher education. Higher per capita incomes are of course the fundamental long-run goal of economic policymaking. They are the reward for producing high-value output. But it is important to recognise the nature of output. Terms of trade booms deliver rapid increases in the value of a country’s output, but are usually transient. 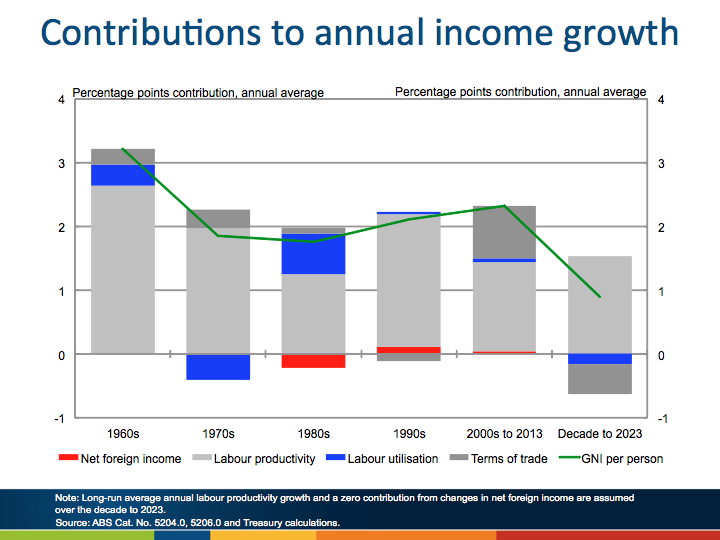 Since then, as the above chart from Treasury shows, Australia has been heavily reliant on the terms of trade windfall to drive rapid growth in incomes. While this has been a boon for the living standards of Australians, it also leaves them exposed to a downturn in the terms of trade; and unfortunately that is precisely what we are witnessing today. Iron ore was well and truly into its annus horribilis when I started this series, however shortly afterwards I pointed out that it appeared primed for a ‘Q3 capitulation’. This is just what we got, with iron ore falling another 8% since that post, and looking likely to break $80 this week. So, with the terms of trade now a serious drag on national income, Australia will likely need to endure an extended period of flat or falling real incomes to regain its competitiveness and reinvigorate its non-mining trade-exposed sectors. In other words, it requires a lower real exchange rate. If a country is lacking international competitiveness and needs to readjust it’s real exchange rate, arguably the least painful way of doing so is by raising productivity, such that the high cost structure of the economy can be justified by the value of goods and services being produced. There are a variety of policies which can facilitate higher productivity; in Australia they have often been lumped together under the term ‘microeconomic reform‘. Broadly speaking, these were the sorts of policies that drove Australia’s impressive productivity performance in the 1990s. If a country is severely uncompetitive and heavily reliant on imports, then it may be unfeasible to raise productivity sufficiently in the short-term, and the exchange rate must depreciate. This is best achieved by a swift decline in the price of the local currency relative to international currencies, without a corresponding rise in the domestic price level. However, an interesting case has arisen lately in which a number of advanced economies no long possess the ability to devalue their currencies. These are the countries that have adopted the euro, and devaluation for them means something quite different. Without a nominal exchange rate fluctuating against many of their major trading partners (other Eurozone countries), if countries using the euro find themselves in an uncompetitive position, they must turn to the final component of the real exchange rate; the domestic price level. This means that lower domestic prices are required to regain competitiveness, with the most important price being the price of labour (wages). Unfortunately wages are usually quite sticky, meaning they adjust downwards slowly and reluctantly, through high and protracted unemployment. The parlous state of the periphery economies of Europe in recent years reflects this slow, painful process of ‘internal devaluation’. The RBA has long grappled with the stubbornly high Aussie dollar (Australia’s nominal exchange rate). Indeed, one of the most familiar phrases to keen readers of RBA communiques is surely “the Australian dollar remains high by historical standards.” The reason much of the policymaking establishment in Australia has been eager to see the Aussie dollar fall alongside the terms of trade is so that we may avoid the fate of the European periphery, and readjust our cost structure without the painful experience of high and protracted unemployment. The price of the Australian dollar against other major currencies (and minor ones of countries with whom we compete) is therefore an important determinant of the interest rate outlook. At the time I began writing this series, the AUDUSD was trading around .9300; at the close last week it sat at .8926. As I noted this week, the timing of the fall this past fortnight caught me a little by surprise. It came courtesy of a sharp rally in the USD, and although USD strength has been a central theme of my market view for around 18 months, exactly when it was going to break out I could not say. The USD is now in the process of establishing a firm, if belated, uptrend. Only a sudden and unexpected deterioration in economic conditions in the US will derail it now, and this could have important ramifications for Australia. A sharp depreciation in the AUDUSD (sub .8000), would take a great deal of pressure off the RBA. 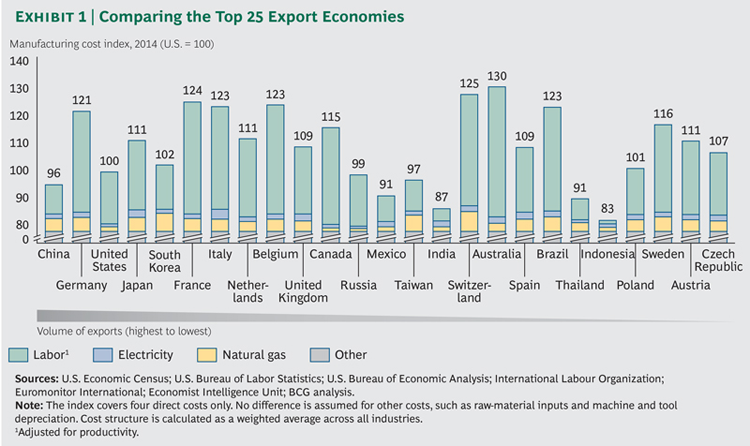 It would support exports and jobs, and should revive investment in non-mining tradable sectors. It would also support state and federal budgets by raising company tax revenues. The real value of household income would be reduced by the higher cost of imports, and this would crimp consumption somewhat, however this is the entire purpose of a real exchange rate depreciation, and therefore unavoidable. Also, the loss of household purchasing power could well take the steam out of house prices, which would provide the RBA with more freedom to cut rates, since strong house prices have been a growing concern for policymakers. Overall though, a sharp depreciation in the Australian dollar would lessen the need for the RBA to cut interest rates. The overarching theme as I commenced this exercise was that the twin determinants of the next move in the cash rate were house prices (and by corollary, household spending habits) and the terms of trade. To be wrong in my view that the next cash rate move would be down, I argued the following scenario would need to transpire: the housing market leap out of the winter lull and record brisk spring price gains, and iron ore rebound smartly, albeit likely to lower levels than earlier this year (for this to happen I expected China would need to revert to loose monetary settings and another splurge in fixed asset investment). This scenario seems to be growing less likely as the weeks wear on. As Stephen Koukoulas pointed out recently, the housing market is actually showing few signs of a continuation of the past couple of years’ gains. I certainly think it’s too early to say that the top is in, but with the market ever-more dependent on speculative demand for investment properties, and national income growth being eroded, the the bullish case for house prices is increasingly tenuous. The news has of course been considerably worse for the terms of trade; the iron ore bounce I heralded early last week turned out to be a rigid moggie. Now that we’ve printed a new low I won’t even venture a guess at where this ends in the short-term. A Q4 rebound will almost certainly happen, but that doesn’t mean much if it only rebounds to say, $90. If that’s all we get out of the Q4 restock, severe pain looms in 2015. As always, we watch China closely for signs of meaningful monetary and fixed asset investment stimulus. But the signs of stimulus on the magnitude we’d need remain elusive. So I am going to stick to my rate cut call, with an eye to late Q1 2015 or early Q2, on the assumption that iron ore receives some relief into the end of this year, house price growth is subdued and the Australian dollar does not rapidly devalue below .8000. *This must be monitored closely as it could present an ugly situation for the RBA: It would negate the improvements in Australia’s competitiveness from a lower AUDUSD, since in real terms the exchange rate won’t have fallen by as much as in nominal terms, and so jobs growth and investment spending won’t recover as strongly. This would argue for lower rates. But if wages start to jump in response to high consumer prices, then the RBA would arguably be compelled to hike. Still, for now I believe this ‘stagflation’ scenario to be a remote possibility. This entry was posted in Uncategorized and tagged Australia, exchange rate on September 21, 2014 by MJV.